With increased security built into Windows Server 2003, there are few things to be aware of when running the DETEXI software on this platform. If camera configuration is required outside of the DETEXI NVR and Client, it can be done using the camera’s HTTP interface in Internet Explorer. Security in Windows Server 2003 is inherently locked down, and sites must be added to the Trusted Sites list. 1. In Internet Explorer, choose Tools – Internet Options and switch to the Security tab. 2. Choose Trusted Sites icon, and click Sites button. 3. Enter the address for the camera control, and click Add button. Windows operating systems XP and above have built in firewalls. If the firewall is enabled, it will block communication on ports used by the DETEXI NVR and Remote Clients. You need to adjust settings for the DETEXI programs that use an open connection to the Internet. You should make an exception for these programs, so that they can communicate through the firewall. 1. 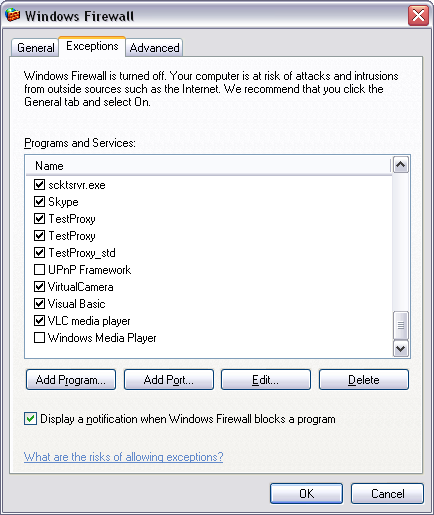 Open the Windows Firewall dialog from Control Panel – Windows Firewall. If the Off radio button is enabled, nothing needs to be done. 2. If the On radio button is enabled, make sure the Don’t allow exceptions checkbox is unchecked, and switch to the Exceptions tab. 3. Click Add Program button. 4. 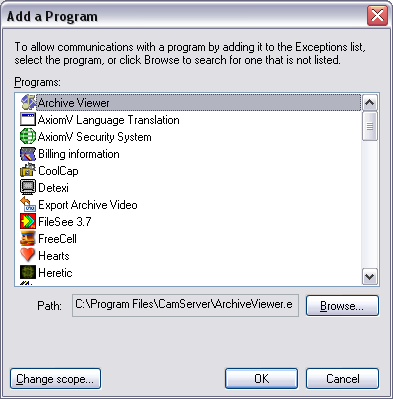 Browse to the DETEXI NVR home directory (c:\Program Files\CamServer by default) using Browse button. 5. 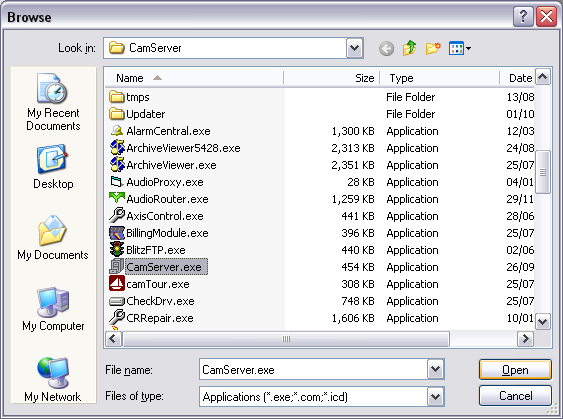 Find and open CamServer.exe program. If the Data Execution Prevention (DEP) feature is enabled in Windows Server 2003, it will block the DETEXI NVR services from running. You may receive a message, indicating that the service program has been closed by Windows. 1. If you received a message dialog indicating that Windows has closed the program, then click the Change Settings button. 2. If you received no message but the Recorder or some other service will not continue to run, you can open this dialog through Control Panel – System – Advanced – Performance Settings and switch to the Data Execution Prevention tab. 3. 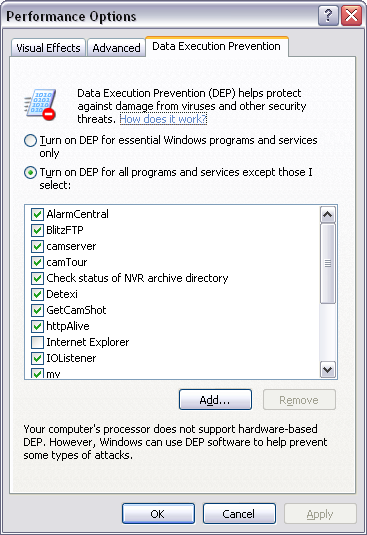 To turn DEP off for most applications, choose Turn on DEP for essential Windows programs and services only. You will be prompted to restart your computer before the changes will take effect. 4. If you would like to leave DEP on, simply use the Add button to add DETEXI NVR services to the exception list. If you opened this dialog from the DEP message dialog, the application being blocked will already be in the list for you to simply check off. Make sure any application added to the list is checked off.